"Our family is all about adoption. When we moved to Kentucky ten years ago, two cats 'came with' the purchase of our home. Several years later we adopted a cat from a neighbor whose daughter had brought it home as a stray. 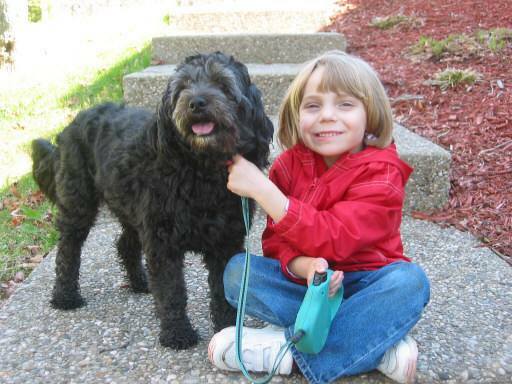 "Our dog Tillie was adopted from the Meade County Animal Shelter in May 2001. Dog warden Harry Jones found her trotting down the street with another stray dog and picked her up. "Just a few months later, we adopted our daughter Nadia, then 34 months old, from an orphanage in Ukraine. "Tillie is a Terrier-Poodle mix and was probably about a year and a half old at the time of adoption. We knew adopting her only a few months before traveling to Ukraine was not the smartest move we ever made, but Tillie was just the friendliest and sweetest dog who deserved a second chance at a home. It was obvious she didn't have a mean bone in her body and would be great with kids. Tillie was well received by our personality-plus cat, Inky, who really needed a playmate. The two of them are great buddies who spend the day playfully tormenting each other and then sleep together on the end of our bed most nights. "Tillie and Nadia are great friends, too, and Tillie has more or less become a 'sibling' for our only child. The Ukrainian word for dog is 'sabaka,' which is what Nadia first called Tillie when she couldn't pronounce her name. This was later shortened to 'baka' and now Tillie's other name is 'Dogka.' She answers to both! "It goes without saying that we think adoption is a great thing. So much love and laughter has filled our home as a result of these four wonderful adoptions. We wouldn't have life any other way." This picture was taken when Skeeter and his owner went through obedience classes together. His owner adopted him from the Meade County Animal Shelter when he was 3 or 4 months old and weighed about 20 pounds. He had been found wandering on a road. He's now about one year old and weighs about 70 pounds. His owner thinks he has some Springer Spaniel in him, but at 70 pounds, there's something besides spaniel in his blood. Skeeter graduated from obedience class and is now working on more tricks. He misses class, though, because he enjoyed meeting the dogs and people that came there. He loves to chase squirrels and even cats (if they run), but when the dog and cats tire they end up curled up together. "I still sometimes wonder how I wound up with Lady, 66 pounds of sheer exuberance (in public) and a floor rug in private. I merely attended the PINS humane society open house at the shelter in 2001 to visit our donated cat cage (we had four cats that RULE). "But of course the PINS staff (Claudia, as I recall) just had to show me Lady and her unique trick of hugging potential owners. I hadn't had my hug that day and it was love at first embrace. As it turned out, Lady was neither practical nor space efficient, and she pulled me off my feet at Claudia's obedience training class. But there's nothing like the unconditional love of a big dog and that welcoming hug when you walk in the door. The cats still don't think much of our new big lumpy throw rug, and Pat has tripped over her more than once at night, but we all love her and she's part of our family now. Oh, yea, Lady brought home her own white kitten on one of Steve and Lady's walks, so now the cats are five." "My name is Stuart Little. I was the first dog adopted at the first 'animal event' Pets In Need Society ever held. A PINS member discovered me at the county dog pound, where my previous owner left me because she was moving away and couldn't take me with her. I was really skinny, had really wild, wiry hair, and was afraid of everything! The PINS volunteer named me Stuart Little because I was a little white mousy-looking thing. "My new mom (Virginia Thompson) fell in love with me the minute she saw me and took me to live with her and two other dogs, two cats, and miniature horses. I love to go to the barn with Mom and watch as she tends to the horses. I play with the other dogs and would like to play with the cats, but they aren't interested in me. I ride in the little horse-drawn carts my Mom hooks up to the little horses. I get to travel a lot with her to the horse shows and events. I really like that. My Mom takes good care of me, feeds me well and loves me a lot. (You can tell that from my less than slim figure.) I'm really glad that Pets In Need Society had the animal adoption event at Video Vault in 2000, or who knows what would have happened to me. Thanks, PINS volunteers for helping the animals of Meade County!!"